Tell us approximately when you wish to meet us at the terminal on the day of your departure or if you are staying in a hotel, your desired check in date. If you are just parking, tell us the date of your return flight and the scheduled landing time. Enter your information and, if you are parking, your vehicle details. We’ll send you an email & a text message (text if requested) to confirm your booking, as well as your arrival instructions. 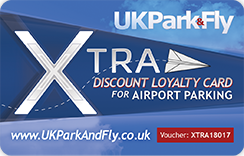 Get your Discount Loyalty card and start saving all year on your Airport Parking & Hotels! When you book meet and greet parking through us, the airport parking provider will meet you at the terminal or approved set down point, we and take your car to their secure storage facility. Your car is delivered back to you upon your return, making your trip hassle free and your parking safe, secure and unbeatably convenient. Our close relationships and big buying power with the UK's leading airport parking operators mean that we get the best prices, and we pass the savings on to you. Booking the best parking or Airport Hotels couldn't be easier! Why UK Park & Fly?